Kjolhaug Environmental Services Company, Inc. (KES) has been involved in a number of urban wetland projects on both public and private land. Our role in the process has been from start to finish, and typically after approval to include monitoring. A few examples are provided below. The West Ridge Park project, located in the City of Mayer, mitigated stormwater impacts from surrounding development through the creation of a stormwater pond and adjacent created wetland complex, and an infiltration swale. Native herbaceous and deciduous plantings enhance the park’s natural atmosphere while providing for wildlife habitat. KES was involved throughout the process including wetland delineation, plan design and permitting, and native vegetation contractor coordination. Our works continues through the present with wetland monitoring. 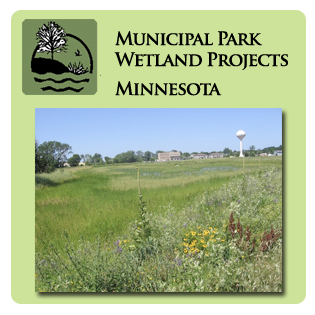 A wetland restoration, banking plan, and trail construction project was completed the City of Rogers, Minnesota. The 290W Wetland Restoration plan involved an environmental inventory, wetland delineation, and banking application review. Project implementation involved restoration of hydrology to a partially-drained wetland by installing an improved outlet structure and blocking drainage “improvements”. A paved walking/riding trail with observation overlooks was constructed to facilitate access and enjoyment of the area. Wetland Conservation Act banking credits were generated by the project and later utilized as replacement for wetland impacts within the City.